Today's post is a split personality. 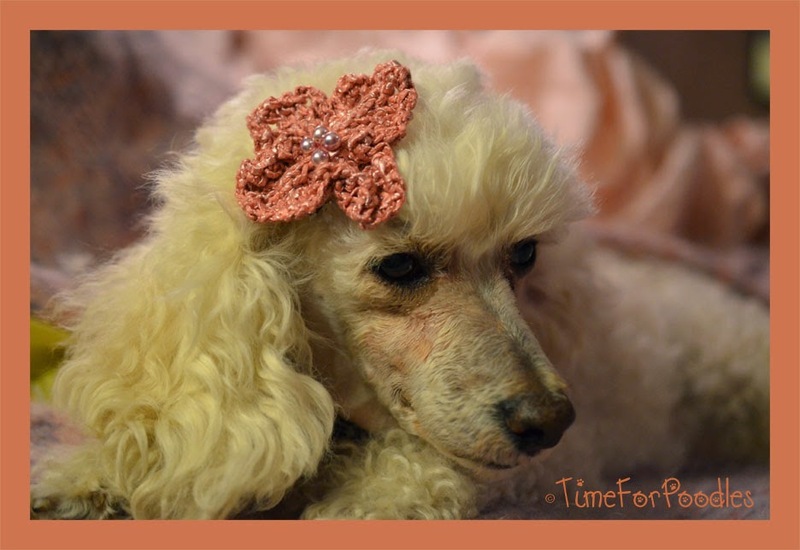 I am combining my knitting and my Poodles. This small pink knitted flower is knitted using the traditional counterpane technique. I teach a class on knitted counterpanes and I just finished this up as a sample. If you knit and want to make these, the basic pattern can be found in the upper tabs of the Meadowtree Journal. We only have grandsons, so I don't think a model was forthcoming in that direction. So it was,"Millie, where are you"? I think the old girl looks rather smashing in her pink flower. She is about ten years old and almost completely deaf. She can see only out of one eye. She came with a raging ear infection. It is not longer an issue, but it is chronic, which means she needs drops at least three times a week. She will not go down steps. However, she can go up some steps as long as there are not many of them. Sometimes she's potty trained and sometimes she isn't. I guess it depends on her mood. But you what else about Millie, she is the happiest little dog I know. Her tail never stops wagging when she is around us. And when she sleeps, she sleeps! That can be one relaxed dog. I am lucky in that I have a daughter who is a veterinarian and can help me out at a moments call. I have used her expertise plenty when it comes to Millie. I want the best for Millie and she can stay here as long as she wants. We are crazy about Millie. And that is it for the day.